Global warming, acidification, and oxygen stress at the Paleocene-Eocene Thermal Maximum (PETM) are associated with severe extinction in the deep sea and major biogeographic and ecologic changes in planktonic and terrestrial ecosystems, yet impacts on shallow marine macrofaunas are obscured by the incompleteness of shelf sections. We analyze mollusk assemblages bracketing (but not including) the PETM and find few notable lasting impacts on diversity, turnover, functional ecology, body size, or life history of important clades. Infaunal and chemosymbiotic taxa become more common, and body size and abundance drop in one clade, consistent with hypoxia-driven selection, but within-clade changes are not generalizable across taxa. While an unrecorded transient response is still possible, the long-term evolutionary impact is minimal. Adaptation to already-warm conditions and slow release of CO2 relative to the time scale of ocean mixing likely buffered the impact of PETM climate change on shelf faunas. 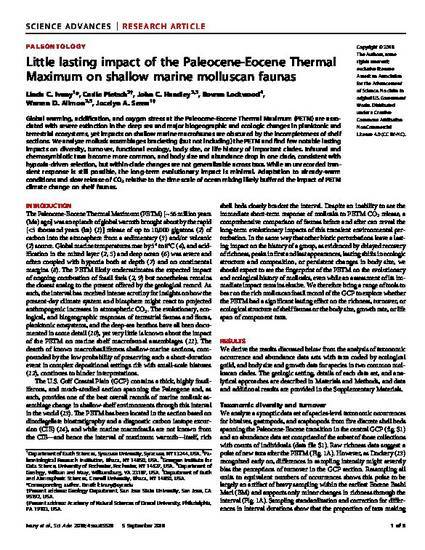 This article was published in Science Advances, volume 4, issue 9, 2018, and can also be found online at this link. Copyright © 2018 The Authors, some rights reserved; exclusive licensee American Association for the Advancement of Science. No claim to original U.S. Government Works. Distributed under a Creative Commons Attribution NonCommercial License 4.0 (CC BY-NC).This is an open-access article distributed under the terms of the Creative Commons Attribution-NonCommercial license, which permits use, distribution, and reproduction in any medium, so long as the resultant use is not for commercial advantage and provided the original work is properly cited.